This year's Savannah Stopover happens March 7-9 at various venues around town. This morning they announced their complete lineup for the festival, now marking its ninth year. Wave II adds more than 40 bands to the lineup including several favorite returning acts: Pylon Reenactment Society, William Tyler and Caitlin Rose. "A slew of red hot discoveries" are also just announced, including Faye Webster, Louis Prince, Illiterate Light, Sun Seeker and McKinley Dixon. 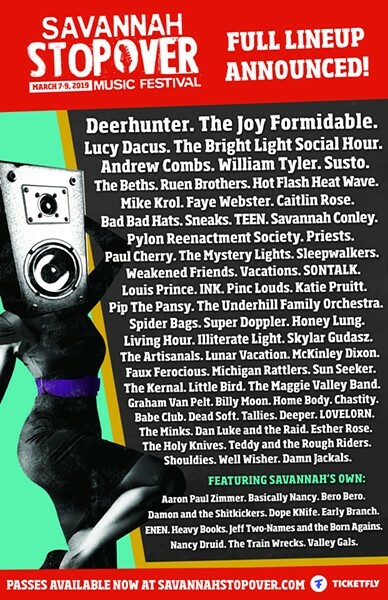 Headliners already announced are Deerhunter and The Joy Formidable. Local acts to be featured are Aaron Paul Zimmer, Basically Nancy, Bero Bero, Damon and the Shitkickers, Dope KNife, Early Branch, ENEN, Heavy Books, Nancy Druid, Jeff Two-Names and The Born Agains, Valley Gals, and The Train Wrecks.